Like Father, Like Son? Not Exactly When It Comes To Rand And Ron Paul : It's All Politics Ron Paul laid the groundwork for his son's political rise. But Rand is making it very clear — this is not his father's campaign. Ron Paul doesn't figure to be a major part of his son Rand's presidential campaign — despite Ron's having run in the last two presidential elections. Ron Paul stood off to the side Tuesday as his son Rand announced he was running for president. There was no speaking role for the elder Paul, 79. There was no ceremonial passing of the torch of "liberty." There wasn't even a hearty thank you or nod to the father's raucous presidential campaigns that laid the groundwork for the son's launch. "I never could have done any of this without the help of my parents who are here today," Rand Paul said in Louisville, Ky., in the only section of his speech that made allusion to his father. "I'd like you to join me in thanking my mom and dad for all their help and support through the years." Help and support with politics? Not so much. Ron Paul looks on as Rand, a Kentucky senator, arrives for the announcement of his presidential campaign. "With my parents' help," he continued, "I was able to make it through long years of medical training to finally become an eye surgeon." Before Rand spoke, former Rep. J.C. Watts, a Paul supporter, joked that backstage when Ron heard, "Run, Paul, run," Ron said, "I'm not doing this again." Ron did always have a sense of humor. The scene said it all. Despite the energy and enthusiasm the former congressman's most recent two presidential bids created, he'll be sidelined this time. Rand and Ron are said to be close, but Rand is trying to go where his father never could — to find an electorate beyond a narrow, though devoted, base of young, libertarian men. Rand has his sights set higher. And he does not want his candidacy conflated with his father's. Ron, who retired from Congress in 2012, always stood out for his frankness in a talking-points-laden world. But he was always an outsider. "Libertarian" barely fit in the GOP for most of his quarter-century in Washington. He ran unsuccessfully as the Libertarian nominee for president in 1988. Ron was a quirky staple of the last two presidential campaigns. In 2008, he finished fourth for the nomination, winning just a few dozen delegates. That all changed when the Tea Party came along in 2010. Stars were born, from the Palins to the Cruzes. But the Pauls were there from the start. They were at the ascension of the nascent political movement. Suddenly, everything the septuagenarian gadfly with the ironic following of young libertarians was fighting for was going mainstream in the GOP. 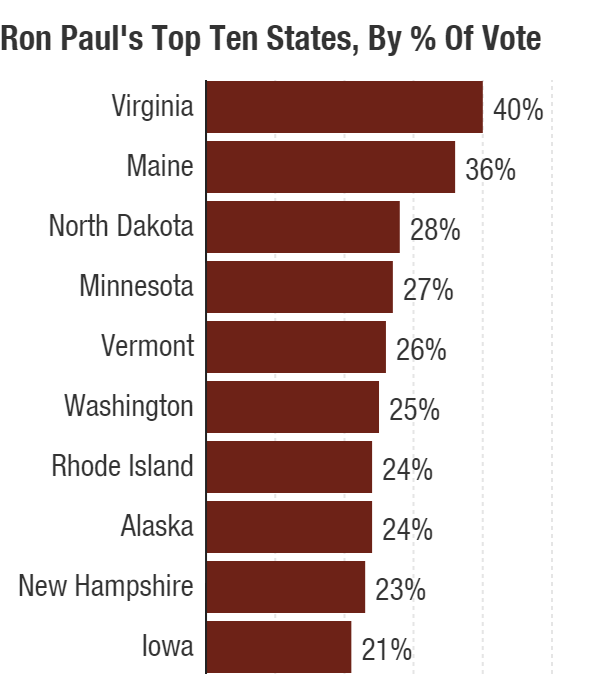 The Tea Party was influencing policy and helping the GOP win state and local elections. But even as Ron Paul helped propel the cause with his refreshingly impolitic style, his presidential run, was still regarded as quixotic. He didn't win a primary or caucus 2012, but his campaign and devout volunteer activist followers were able to engineer a few wins. In addition to several straw poll victories, he won the most delegates in half a dozen states in 2012, including Iowa. He also finished second in New Hampshire and third overall and took home more than 100 delegates. Rand Paul burst on the scene in Kentucky as part of that 2010 Tea Party wave. "I have a message from the Tea Party," Rand said on the night of his Senate victory, "a message that is loud and clear and does not mince words. We've come to take our government back." In the subsequent two years, Rand followed his father to places like the Iowa State Fair. He'd have his hands in his jeans pockets, strolling over the dirt and grass patches like a baseball scout eyeing a prospect others didn't quite recognize. He would do it differently than his father, inspired by his father, but not the same. He would do it in a way that would try to mainstream libertarianism. "Quixotic" and "quirky" wouldn't be words associated with his campaign. He also planned to be ready. His father's team always seemed to be riding on momentum, a certain inspirational high. But it was, at times, caught off guard when the digging began. Like the revelation of the newsletters Ron Paul founded that made derogatory remarks about African-Americans and gays. Paul denied any editorial involvement with the newsletters, but they still had his name on them. At the very least, it revealed a certain lack of professionalism in his operation. Rand, on the other hand, proved he wouldn't let a hit go unchallenged during his 2010 Senate race after his Democratic opponent Jack Conway used allegations from a GQ article in a TV ad, accusing him of tying a woman up and having her bow down before an "Aqua Buddha" during his college days. Paul wouldn't shake Conway's hand after a contentious debate and called him a "disgrace." Instead of solely railing against the powers that be, Rand befriended them. There are few more disliked within the Tea Party than Senate Majority Leader Mitch McConnell. 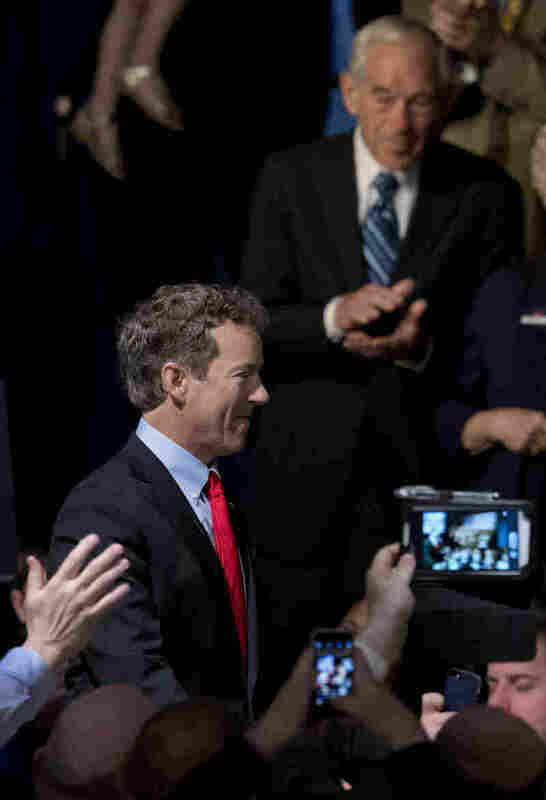 But, unlike Ted Cruz — the braggadocious other senator with Tea Party backing who has already announced for president — Paul formed an alliance with McConnell, the powerful senior senator from his state. That's despite McConnell's saying in 2014 that establishment Republicans were going to "crush" Tea Party candidates across the country. Nonetheless, Rand endorsed McConnell in his contentious re-election. In turn, McConnell has already endorsed Paul for president in 2016. It's the kind of endorsement his father never won, as National Journal put it. Where his father is the idealist, Rand is the savvy pragmatist. Where Ron spoke his mind, regardless of the politics, Rand is more subtle. Take drugs, for example. Here was Ron Paul talking about heroin during a 2012 Republican presidential debate. "How many people here would use heroin if it was legal?" Paul boasted, waving his arms, clearly annoyed with the underlying premise of the moderator's question. Chris Wallace of Fox News had asked, "Are you suggesting that heroin and prostitution are an exercise of liberty?" Paul continued, "I bet nobody would put their hand up, 'Oh, yes, I need the government to take care of me. I don't want to use heroin, so I need these laws!' "
That is not Rand's style. He hasn't even backed legalization of marijuana. "I really haven't taken a stand on ... the actual legalization," Rand Paul said last year, "but I'm against the federal government telling them [states] they can't." 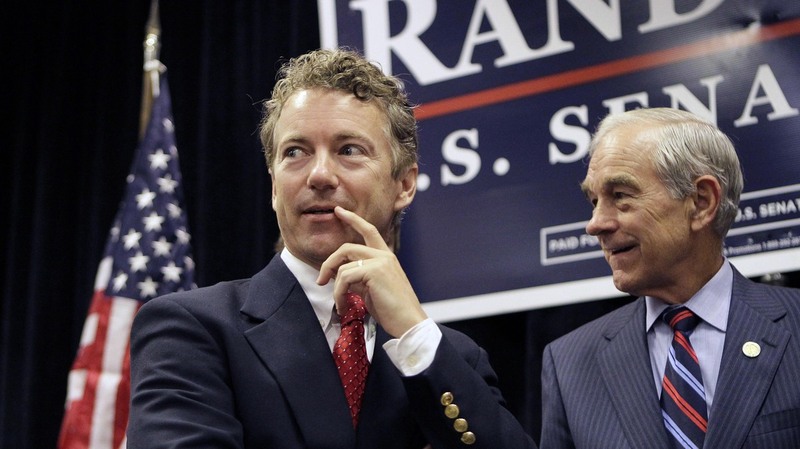 For 2016, even if Paul doesn't win the nomination, he hopes his brand of libertarianism can win over a broader swath of the party than his father was able to. "I have a message," he said Tuesday during his presidential kickoff, pausing for effect. Acute observers would recognize this bookend. "A message that is loud and clear and does not mince words. We've come to take our country back." So far, both Pauls — even if one has exited the stage — have already come close to taking their party back.